Orlando Serve Foundation – Board – Bruce Mount Jr.
Bruce A. Mount, Jr. was born and raised in Historic Eatonville, Florida (the oldest black municipality in America). Bruce graduated from Edgewater High School in College Park and went on to become a Presidential Scholar and Academic Hall of Fame inductee at Saint Augustine’s College (currently Saint Augustine’s University) in Raleigh, N.C. with a Bachelor of science degree in Business Administration. While at St. Augustine, Bruce lettered in football and golf, while remaining active in a number of organizations including: Delta Mu Delta Honors society, the Collegiate Chapter of the 100 Black Men of America, and the Kappa Epsilon Chapter of Omega Psi Phi Fraternity Incorporated. 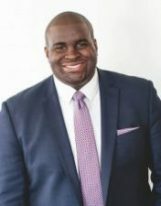 Upon graduation, he returned to Central Florida to pursue a Juris Doctorate Degree at Florida Agricultural & Mechanical University College of Law. Bruce began his legal career with the Public Defender’s Office in the Ninth Judicial Circuit where he zealously advocated for the indigent. Bruce remains active in the community serving on a number of other boards including: Vice-Chair of the Florida Bar Diversity & Inclusion Committee, Past President of the Virgil Hawkins Florida Chapter of the National Bar Association, Board of Directors-African American Chamber of Commerce, Orange County Teen Court Advisory Board, and the Board of Directors – Boys & Girls Clubs of Central Florida – Joe R. Lee Branch. Bruce is married to his amazing wife, Shayla Mount, who also practices law in the Central Florida area.